Your Relationships and Your Principles"
Front & Back Cover of Phyllis Peterson's newest book. We live in a world full of temptation, fantasy and hedonism. It is difficult, sometimes, to remain focused on what is real, lasting and of value when the rest of teh world sings its siren song of self-gratification and easy familiarity. This is a book created to help people who are struggling to remain faithful to their primary relationship. Knowing what is right is one thing. Being able to do what is right in the face of temptation and disappointments is another. Doing what is right requires the kind of soul-level understanding that comes from combinging the inspiration of the Creative Word with the insight born of reflection. For inspiration, this book offers the Writings of Baha'u'llah, Prophet-Founder of the Baha'i Faith, and the explanations provided by his son, Abdu'l-Baha. To encourage reflection, the author has provided observations and questions born of her own life experience and that of the many people she has helped through the years. Phyllis K. Peterson is the author of several books, including Assisting the Traumatized Soul, Healing the Wounded Talisman, and The Heroic Female Spirit. Her program to protect children from exploitation has been adopted by the Ministry of Social Services in Botswana. She is also available to present workshops on communicating feelings and establishing personal boundaries. Her Boundaries Game is being used in Family Violence Centers across the nation. A book on intimacy in the Baha'i Community is forthcoming. "The Heroic Female Spirit: A Collection of Tales"
In the tradition of Joseph Campbell, these stories employ many of the moral virtues found in every religion. The heroes in each tale strive to reshape and improve the world around them, showing the qualities of the heroic female spirit at work. Myths and legends have traditionally been the domain of men and boys. The gallant hero is almost always male. In "The Heroic Female Spirit: A Collection of Tales," author, performer, and storyteller Phyllis Peterson shows women and girls at the center of each story - discovering their inner gifts, defying restrictive customs, and creating peace between seemingly implacable foes. These young women demonstrate that heroic qualities are not only the domain of young men and boys, but rather these qualities are within each of us, regardless of gender. Each tale shows a young woman making a difference by acting fearlessly to improve the world around her. 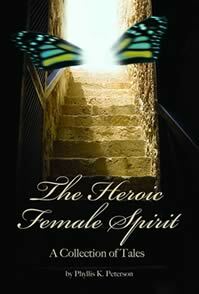 "The Heroic Female Spirit" brings together enjoyable, inspiring stories that will appeal to people of all ages and will redefine the prototypical hero. Phyllis K. Peterson is the author of "Healing the Wounded Soul." A talented performer and storyteller, Peterson enjoys writing and telling stories about maintaining healthy personal boundaries, the authority of self, protecting children from abuse, and anger management. She lives in Machesney Park, Illinois.